The world's largest offshore wind farm opened today off England’s South East coast. Thanet Offshore Wind Farm has 100 turbines and will generate electricity equivalent to the annual consumption of over 200,000 British households. The wind farm covers an area of 35 square kilometres, which is the equivalent of 4,000 football pitches. The company behind the project field is the Swedish Vattenfall. 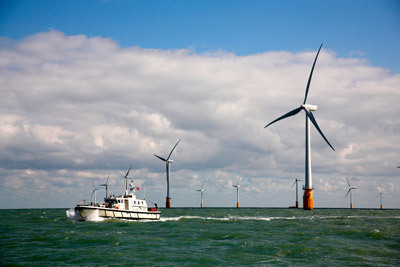 Thanet is the company’s largest offshore wind farm to date and represents a significant investment in renewable energy generation. The electricity generated from the English Channel winds will constitute a significant increase of green energy in the UK and a considerable contribution to Vattenfall’s efforts to decrease the amount of carbon dioxide emissions from its electricity generation. 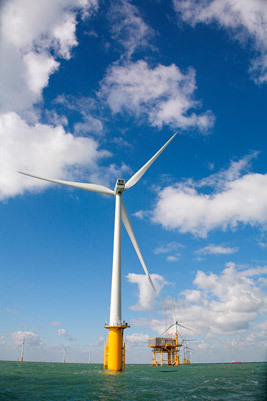 The total investment for completing the wind farm is in the order of around £780 million. A proportion of this was spent locally with benefits for local suppliers and services, including local contractors and workers who were used in support of the development. The opening ceremony took place at sea with the CEO and President of Vattenfall, Øystein Løseth, and the British Secretary of State for Energy and Climate Change, Chris Huhne MP, among the participants with the 100 wind power turbines as an impressive backdrop. Pointing out that Thanet Offshore Wind Farm’s 300 megawatts (MW) will take UK installed wind power capacity across the 5,000MW line, Rt. Hon. Chris Huhne MP hailed Vattenfall’s impressive engineering achievement and praised the energy company’s commitment to wind power in the UK. He said: “I’m pleased that we’ve reached the point where 5GW of our energy comes from onshore and offshore wind – that’s enough electricity to power all the homes in Scotland. Getting these massive structures out here into the sea is a tremendous feat of engineering and I applaud all involved with this awesome achievement”. “We are in a unique position to become a world leader in this industry. We are an island nation and I firmly believe we should be harnessing our wind, wave and tidal resources to the maximum. I know that there is still more to do to bring forward the large sums of investment we want to see in low-carbon energy in the UK, and we as Government are committed to playing our part”. The construction of the 300 MW Thanet Offshore Wind Farm has taken just over two years and the wind farm is expected to operate for at least 25 years. 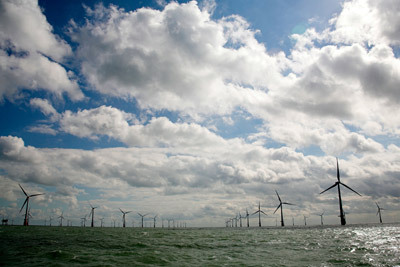 At 300MW, it is the largest offshore wind farm in the world. Each Vesta's V90 turbine is up to 115 metres tall at its highest point.